Here is a link to download the printer-friendly PDF version. For Crust: In a pie plate, combine all ingredients with a spoon. When all the flour is moistened, gather all the dough into a ball and put it in the center of the pie plate. With your hands, press the dough across the bottom and up the sides of the plate, forming a shell. No need to grease the plate (the oil in the dough keeps it from sticking). And better yet, no rolling out the dough! For Pie: Pre-heat oven to 375 F. In a large bowl, melt the butter in the microwave. Add the other ingredients except for pecans and mix well. Fold in pecans, and pour filling into pie shell. Bake at 375 for 40-50 minutes, until set. Let it cool to room temperature before serving. Nutrition info: Don’t even worry about it! *My favorite part about making this pie is the crust. It's SO easy! Just a few ingredients, and you mix it together IN THE PIE PLATE--so you don't have extra dirty dishes. Also, there is no rolling out the dough--you literally just push the dough down with your hands and shape it along the bottom and up the sides of the plate. It's foolproof! *This obviously isn't a "healthy" recipe, but considering the change my blog has taken, I'm going to post my favorite recipes, healthy or not. *Starting checking the pie after about 40 minutes to see if it's done. I just jiggle the plate a little and see how the center looks. You don't want to wait until it's completely firm, because the top will burn. It'll still be a little soft when it's done. And it always firms up as it cools. I hope you enjoy it as much as my dad and I do! I love pecan pie but hubby thinks it's way too sweet. I don't understand his madness -- I'll have to give this recipe a go on a smaller scale! I may try this for Thanksgiving. 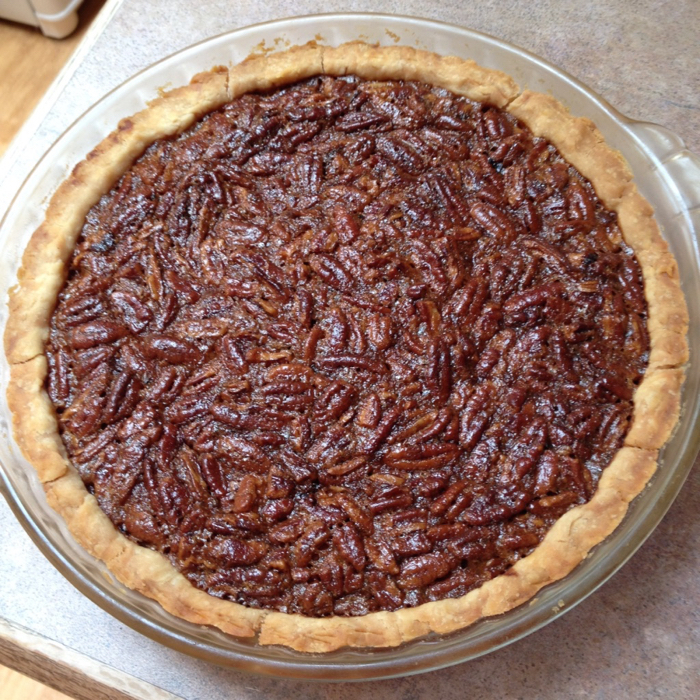 My husband loves pecan pie & when I made it in the past I always used the premade crusts (but they crack so easily!). Can't wait to try this! Do you prefer bake the crust before adding the filling? I LOVE Pecan Pie and have wanted an easy recipe for *so* long. THANK YOU!!! Did you make this in the toaster oven?!!! Yes, I did! I was so skeptical, but it worked perfectly! what kind of oil do you use? do you think melted butter (or solid) would work? I don't like veg oil and the like. I honestly don’t know. If you try it, let me know! I use canola oil (which has no flavor).